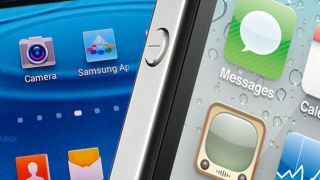 Samsung and Apple are neck and neck in the race to be Britain's favourite tech brand, according to TechRadar publisher Future's latest TechMonitor research. Samsung is a shade ahead of Apple with 26 per cent of the sample plumping for the Korean giant and 25 per cent opting for the US company - significantly in front of Sony (with a still hugely respectable 16%). But among Future readers and the younger demographics, it is Apple that jumps back ahead, suggesting that the race is set to continue for years to come. TechMonitor also asked which of a selection of 33 major tech brands the sample felt were the most innovative and, again, it was Apple that topped the poll closely followed by Samsung. Interestingly Google picked up the bronze medal, ahead of Microsoft and Intel in fourth and fifth respectively. TechMonitor is Future Tech's proprietary research study - providing a detailed root and branch review of the tech buying market in the UK. Studies have been undertaken in 2007, 2008, 2010 and 2011 and are carried out on behalf of Future by The Source. It consists of 2,894 UK responses with two distinct groups, 1,315 nationally representative and 1,579 Future readers.